Please do not contact me if you have cages to sell and you want me to post them here. People have been confused and keep contacting me to sell their cages. This page is only for my cages that I am selling, on the occasion that I have one available. They are BRAND NEW! They are called 2 level Mansions. This cage can hold up to 9 rats. This cage measures approximately 58" tall (44" off stand), 33" wide, 22" deep. It includes two solid metal floor bases and two solid metal platform shelves (11.5" x 21") along with three heavy duty wired ladders (6" wide x 16" long). The tube frame construction and provides 18.5 cubic feet of interior space. 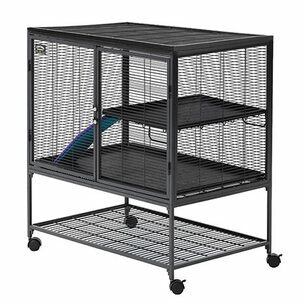 This cage has two large front doors (15.5" x 18”) with strong metal locks. The shelves are all-metal as well (11.5" x 20.5" x 0.75" deep).